When you step into a home for the first time, one of the first things you notice is the floor. You notice whether it’s tile or wood, updated or outdated, and your personal preference or not. What you don’t notice is everything that’s supporting it. It takes a number of layers of materials to make sure the floor is securely supported. When you’re remodeling a room of your home, it’s important to know what layers are under your floors to make sure they can accommodate the type of flooring you’d like to install, a floor-heating system, and any heavy new objects you’re adding. For example, whether your subfloor is made up of concrete or plywood determines whether or not you need a layer of underlayment under your flooring or floor-heating system. A concrete subfloor with tile directly above will inevitably lead to cracking. Likewise, a concrete subfloor without underlayment between it and a floor-heating system will lead to drastic heat loss. Furthermore, the thickness of your flooring can also determine whether or not it’s strong enough to support that vintage cast-iron bathtub you’ve had your eye on. So what are the layers you should be aware of? We’ll discuss them from bottom to top here. Floor joists are a structural component of every home that support the entire structure above. They are made of engineered, laminated wood or dimensional lumber that spans all the way from one end of the home to the other. Look at the ceiling in an unfinished basement, or the floor in an unfinished attic, and you’ll see exactly what joists look like. To be sure your home is structurally sound, you’ll want to make sure that these joists are never rotten or damaged as the home ages. If your home doesn’t have a basement, that means it’s built on a cement slab and does not need joists to support the floor. In this case, the subfloor is the first “layer” of your floor structure, which we’ll discuss more in the next section. The subfloor rests on the joists and is most commonly made of plywood or OSB (oriented strand board) that is between 9/32 and 1 1/8 inches thick. It is responsible for supporting the layers of flooring above as well as all of the people and items in the house. It’s also responsible for any squeaking in the floor. If it isn’t fastened to the joists well enough, it can cause the floor to move in place, resulting in noise. It’s typically secured to the joists with glue, nails or screws. In the case of a concrete subfloor, you’ll find a layer of underlayment for insulation on top of the subfloor. This layer of underlayment is necessary because the concrete is in direct contact with the ground and because it naturally absorbs heat, making it particularly cold to the touch. 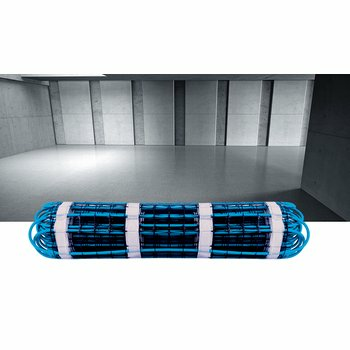 The underlayment provides a barrier between the subfloor and the floor layers above, preventing the subfloor from stealing the room’s heat. 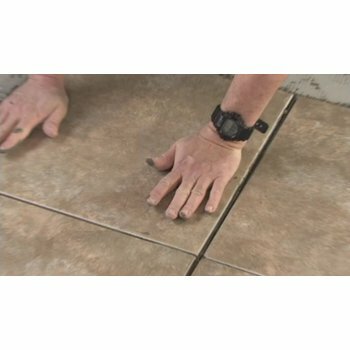 When tile is installed over a concrete subfloor, the underlayment also helps protect it from cracking due to the cold temperature and telegraphing of cracks up through the concrete itself. It’s normal for a concrete subfloor to have cracks, but no homeowner wants those cracks to transfer over to their tile floor! 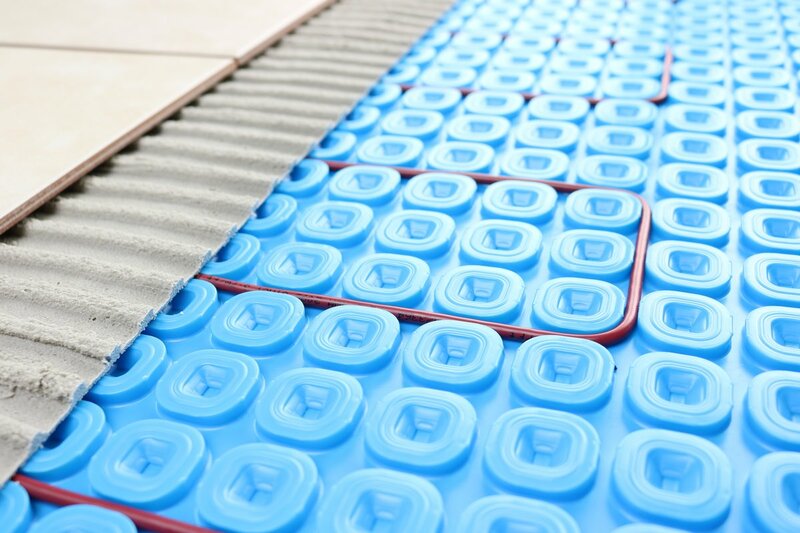 Additionally, when a floor-heating system is installed over a concrete slab, a layer of underlayment is necessary to maintain the level of heat being emitted from the heating element. With floor heating, it’s imperative to ensure that the heat is travelling upward through the floor covering and not downward into the slab. If a floor-heating system is installed (or desired), you’ll find it on top of the subfloor. WarmlyYours Radiant Heating offers electric floor-warming systems that work with both wood and concrete subfloors and nearly every type of floor covering. A range of formats and sizes are available to suit the installer’s level of expertise as well as the layout of the room. Homeowners and trade pros can explore their options and get an instant quote online. Finally, the top layer of the floor structure is the one everyone is familiar with: the floor covering. This can consist of tile, stone, carpet, wood, etc., and it’s known for making a big first impression. After all, it’s the one layer of your floor structure that can be seen, so it’s worth showing off! If you’re planning to update your floor covering and add an in-floor heating system, it’s important to make sure your home has all the right floor layers. By knowing what to look for and what each type of subfloor requires, you’re well on your way to completing a successful flooring project.